Today, I will discuss ” How to write Meta Description for Website manually”. Many of us who is in Blogging when they check their SEO score then you might get these type of errors. Like Meta description not found or the length of the meta description is not proper, Keyword not included in Meta Description tag and more. The question is How to fix meta-issues like meta title, Meta Keywords and meta description? Do Meta Description actually help with search engine optimization? How Can I write different Meta Description for Social Sharing? So, let’s have a look at these topics one by one. if you found any issue then you can comment below. How do you write the meta description for your website? How to Write different meta Description for Social Sharing? The meta description also known as the snippet is a line of text of up to 320 characters, It is also a tag in HTML, that summarizes a page’s content. Search engines like Google show the meta description in search results mostly when the searched for phrase is contained in the description. Meta description optimization is a good aspect of SEO, especially for On-Page SEO. The meta description will also often appear when people share your articles on other websites and social channels like Facebook, Linkedin, and Twitter. It will look like this. So, I think you clearly understood now, What is a Meta description? Now let’s move to the next topic. 2. You can easily decide to click through on your content from search results or not. 3. The more descriptive, attractive and relevant the description, the more likely someone will click through. So, Meta description is all about a summary of your entire content who attracts a searcher to go through your content. Now the question comes where you can find these files. For adding Meta description and meta keyword. Follow the simple steps provided below. 2. Find and open public_html Folder. 3. In Public_.html folder You have to find out either index.html (For a static HTML site) and index.php for a PHP website. 4. Select and Click on Edit option provided in the upper menu, You can also use right-click. 5. Now edit the file as directed above and click on save button. You are done. 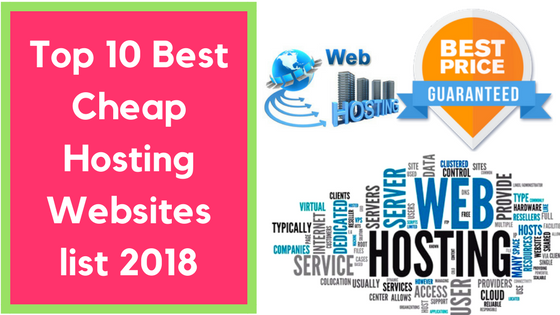 Read Also: – How to choose a best Hosting plan? Do you know? You have complete control of your meta description in your CMS (Content Management System), particularly if you’re using WordPress. If you are using an SEO plugin such as Yoast, then you will be provided a meta description section to write your meta description. For now, the meta description length is increased to 320 characters. You can also see a preview example of how it will look in search engine results pages (SERPs). I am using Yoast SEO Plugin you can use other Plugins for SEO like All In One SEO. Using SEO Plugin writing meta description is a very easy task, it does not require any programming knowledge. So, I hope You understood both the methods of writing a meta description. Yes, It is you always have to include your keywords in Meta description. I am not talking about the Website Keywords. 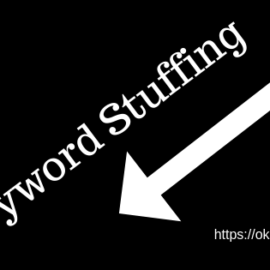 I am talking about the post keyword So, please keep these things in Mind. When you go for SEO checkup of your Website, Web page or Web Post then there is a checksum called Meta Description test which you need to pass. It shows the relevance of meta description in SEO. The answer is no. Google has stated that meta descriptions are NOT a part of ranking signal. But, yes, the quality of the description will influence click-through rate, so it is very important to use this element wisely. 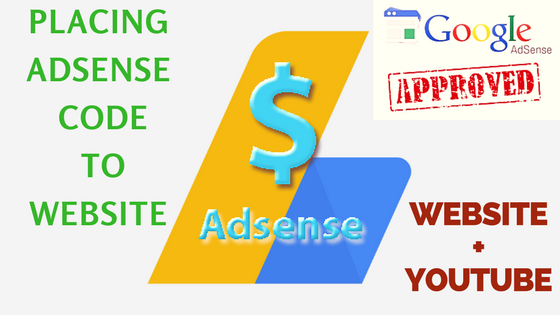 Its main purpose is to get the visitor from Google to click your link. Here I have made some checklist of a writing a good Meta Description which you need to keep in mind while you are writing a post or designing a Web page. 1. It can be up to 320 characters. Recently, Google made changes to the length of search results snippets: 160 characters became up to 320 now. You also have to write up to 320 characters in Meta Description. It might be truncated some because Google sometimes adds the date to the article. 2. It should include a call-to-action. It’s your sales text, where your product is the page that is linked, not the product on that page. Invitations like Learn more, Get it now, Try for free, come to mind and more. 3. The meta description should be unique. Always write a unique meta description for your post and website. But, If you intentionally want to create a duplicate meta description, It will be better for you leave the description empty and have Google pick a snippet from the page containing the keyword used in a search. Mostly Google pics out the first Paragraph. So You have to write your First para wisely. 4. It should contain the focus keyword. I already have mentioned always include your keyword in the meta description. it helps Google to understand the topic completely and will also influence visitor or searcher interest. Google also highlights the meta keywords used in the description you can clearly see this while you are searching something on the Internet. If you are trying to fool Google by mismatching your meta description. Google will find you and penalize you. It will also increase your bounce rate and will also reduce your session duration. So, don’t make it a habit. 6. It could contain structured content. By using schema markup you can add elements to the rich snippets to increase their appeal. For instance: star ratings, customer ratings, product information, calorie counts etc. If you are using Yoast SEO Plugin then It will be very easy for you write two different meta descriptions. One for Search Engines and One for Social Sharing. You already know how to write meta descriptions for Search Engines. 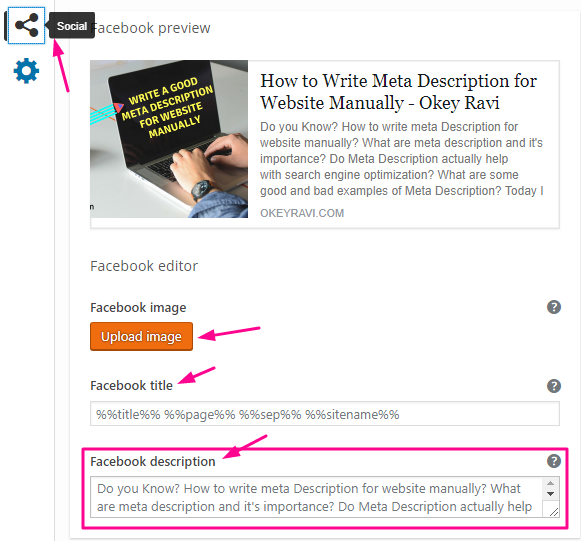 To write a unique and different meta description for Social Sharing follow the steps provided below. I am here doing it on facebook. Step 2: Write unique title and description. You can also use a different image for social sites. I hope the topic “How to Write Meta Description for Website Manually” will be clear to you now. if You have any query you can ask below. 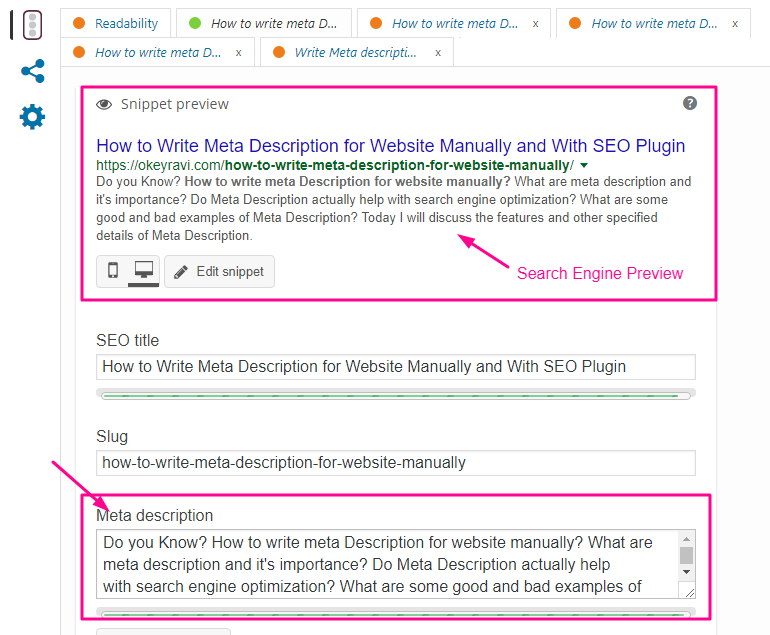 How to add meta description for each blog post in blogger??? In blogger it very typical . 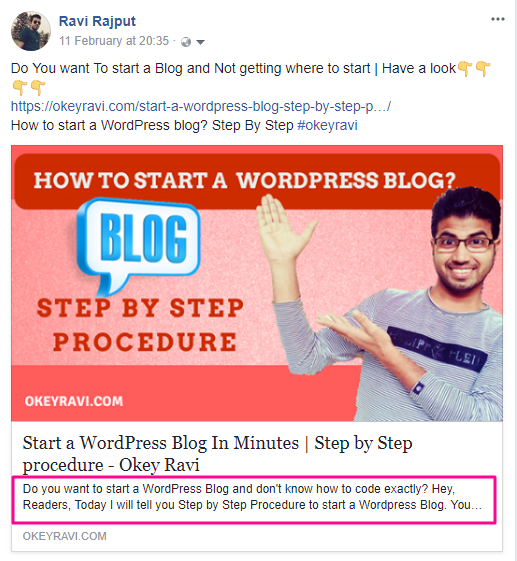 Why don’t you use WordPress?